It can be difficult for the novice collector to estimate antique clocks values. Recently LoveToKnow had the opportunity to interview Andrew Richmond of Garth's Auctioneers and Appraisals about the fascinating world of antique clocks. 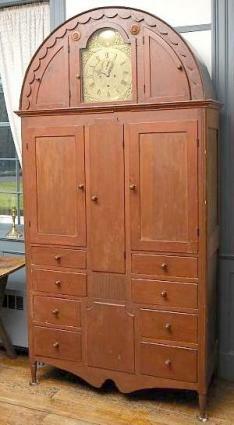 LoveToKnow: How did you get interested in antique clocks? Andrew Richmond: The first antiques auction I worked included a major collection of Ohio clocks. An encyclopedic collection-over 250 shelf and tall clocks, from common to rare, from plain to fancy. Cataloguing that collection and interacting with the serious clock collectors was a real education. That's when I got the bug. LTK: Is there a particular clock that is a favorite of yours? AR: Ohio tall case clocks. Most easterners don't know that Ohio was an important center of clock production. Luman Watson's Cincinnati factory, alone, produced some 25,000 tall clock movements in less than 30 years. Such production means that his movements were bought and sold throughout the Ohio Valley and thus appear in cases from Ohio, Indiana, Kentucky and even Tennessee. Tall clocks tended to be the most expensive item in a person's home in the early 19th century, so you often see some of the finest craftsmanship in the cases. LTK: How can someone identify an antique clock? AR: For the case, you look for evidence of hand crafting, e.g. plane marks, dovetail joints, hand-carved elements, just like you would a piece of furniture. For movements it's a bit trickier. If the movement is wooden, then it's an American clock from the early 19th century, when clock factories were turning out cheap wooden movements by the wagon load. If the movement is brass, then it could be 18th century or 20th century, so you'd have to look for a signature or other markings to help determine age. Of course, if you see a 9-volt battery in the movement, then it's not antique! LTK: What contributes to an antique clock's value? AR: The case is a big part of the value-the fancier the case and the better the condition of the case, the more it's going to be worth. Certainly the maker also plays a role; prolific makers like Luman Watson appear on the market regularly, so they don't tend to elicit high prices, unless the case is a supreme example. Rarer makers, like Samuel Best, one of Cincinnati's first clockmakers, often bring along big prices based on rarity. And for some, the complexity of the movement can add significantly to the price. A standard movement that strikes the quarter hour is pretty common, but an elaborate movement that plays tunes and has a calendar wheel can greatly elevate the value. LTK: Should an antique clocks value be updated for insurance purposes? How often? AR: Like all of your antiques, clocks should be appraised by a qualified and certified appraiser at least every five years, if not every two to three years. You should talk to your insurance agent to see if your regular homeowner's policy will cover damage or loss. For particularly valuable clocks, you should consider a specialty rider to your homeowner's policy that covers antiques. LTK: Will repairing or refinishing an antique clock contribute to its value? AR: A clock with a case and movement in original, untouched condition is always the most valuable than its restored counterpart, but skilled repairs should not be thought of as a bad thing. If a clock movement needs repaired to run, then it will be more desirable if repaired. 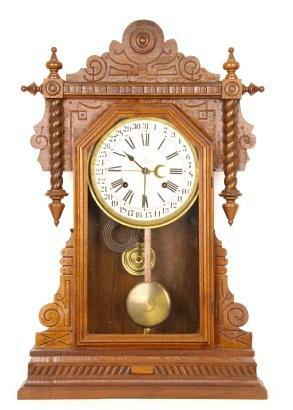 Likewise, if a clock case is missing a foot or a finial, a good replacement will enhance its appeal. LTK: What should a collector of antique clocks look for? AR: He or she should look for a dealer or auctioneer who they trust and then they should look for clocks that they like. You should always closely examine a potential purchase, and talk to the dealer or auctioneer about it so that you know exactly what you are buying. Whether you are collecting clocks from your part of the country or a particular type of clock, buy what makes you smile. After all, you're the one spending the money and you're the one who has to live with it! LTK: If a reader has an antique clock to sell what is the best way to do that? AR: You can certainly try to sell it directly to a dealer that specializes in clocks, but almost always, the best method of selling is at auction, where you get competitive bidding, and where the auction house is on your side. They work on commission, so the more it brings, the better it is for you and them. LTK: How should an antique clock be displayed? Any special tips? AR: Try to keep it out of direct sunlight (it can fade the wood) and out of high-traffic areas where it may get bumped; but, other than that, display your clock where ever you want to know the time! I'd suggest one per room! LoveToKnow would like to thank Andrew Richmond for his time and expertise. Evaluating antique clocks can be tricky. If you have any questions you may want to contact Garth's directly at their website.